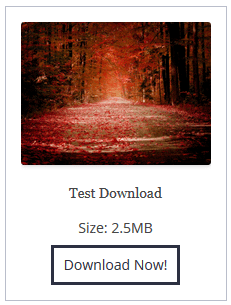 The simple download monitor plugin has an option that allows you to show the file size when you are displaying the download item on a page. Edit the downloadable item in question then enter the file size value in the “File Size” field and save the download. Enable the “Show file size in fancy display” checkbox and save the download. It will now show the file size in the fancy display. The file size will only be shown if you are using a fancy display template that supports this option. The following screenshots show how it looks like when you output the file size.